Partly inspired by the grand ginkgo tree in Hida Takayama that is over 1,200 years old, the Ginkgo Collection features a distinctive 3-sided shape that forms products for dining, living and working. Not only does the comfortable, ergonomic three-legged chair use less material, the design also allows several chairs to fit neatly around a table making it ideal for small restaurants and compact homes. The collection takes a sustainable approach to furniture construction, utilising production offcuts of premium oak that provide an individual and attractive pattern that is unique to each piece. 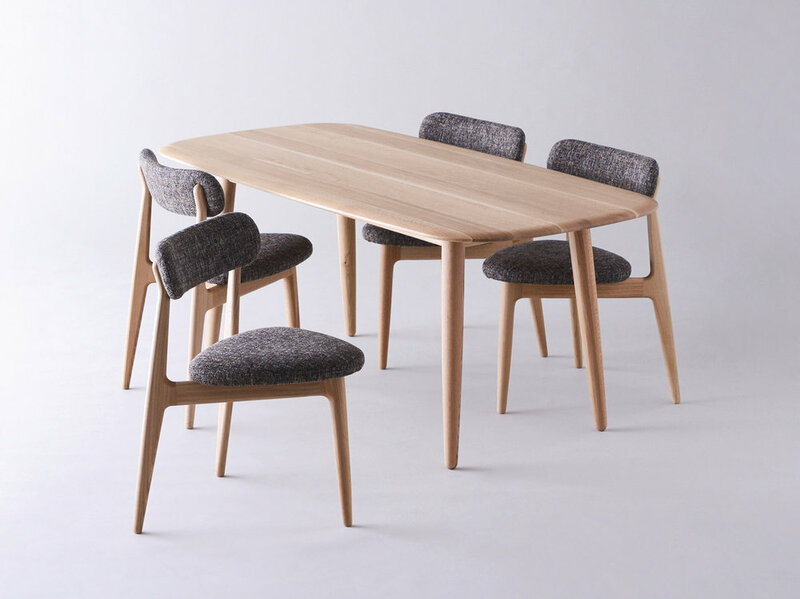 Located in the centre of the Takayama furniture-making district, Nissin has spent over 60 years designing and producing modern furniture for both international and domestic markets. From the choice of sustainable wood to the final hand finishing Nissin controls every aspect of the manufacturing process, enabling them to confidently give each and every one of their products a 10-year guarantee of quality. Nissin believe that simplicity is key when combining contemporary design with outstanding traditional Japanese craftsmanship and that the beauty of a product comes not only from its function, but also from the natural materials and time-honoured skills that go into its making.